Banff sunset during a Banff adventure tour. Thanks to the support of our amazing guests we have been awarded the Trip Advisor Certificate of Excellence Award. This is awarded to companies that are top rated and consistently ranked as excellent by their customers. We stop at nothing to exceed the expectations of each and every one of our guests. We are in the experience industry and providing a superior experience is what we do best. Come and see for yourself! 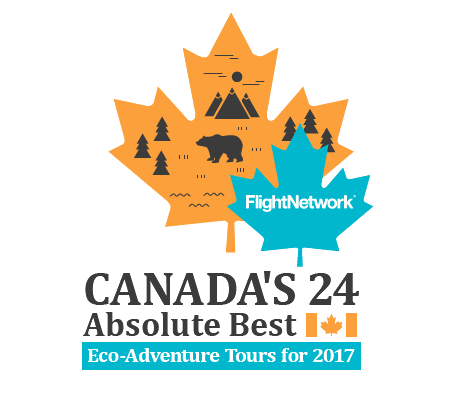 We are proud to have been named one of the top 24 adventure tours in Canada for 2017 by the Flight Network. Specifically our Vancouver Island camping adventure has been recognized as one of the top cultural eco-tour experiences with the immersive nature of the tour. During the tour we immerse our guests in the West Coast lifestyle, hiking through ancient coastal forests, learning about First Nations culture and how the landscape connects the building blocks of Canada. One of our primary goals is to create new and unique adventures that help our guests step off the beaten path and discover new experiences. Our tours are designed to push our guests to learn, not just about the area but about themselves as well. Read full article here. We are proud to announce that Fresh Adventures' founder and lead guide Alex has been awarded 4th in the Tour Radar global Guide of the Year Awards. This awards tracks the performance of thousands of guides around the world, ranking them in order of their reviews. The award is based on the number and quality of reviews for each guide. This has been a great achievement for Alex, competing against guides that work for much larger tour companies and with up to twenty times the amount of guests in a year. Hard work to make sure that each guest has the experience of a lifetime has paid off!